Minnesota lost to Minnesota-Duluth, St. Lawrence lost to Cornell, and Boston University lost to Northeastern in the semifinals of their respective tournaments, so we've got a few possible scenarios for how the NCAA should turn out. Grant over at BC Interruption has created a Pairwise Predictor that allows you to input possible outcomes to generate the likely NCAA field. That's what I'll be using when I talk about scenarios and bids. As always, there's some leeway for the NCAA committee -- we saw it last year with Princeton -- so while the Predictor SHOULD show how things play out, there could be some variance. You've been warned. We've actually got three great games lined up today. All three games should pretty much be toss-ups. Cornell upset St. Lawrence in the semifinal to advance the ECAC championship game. Watch: The semi-finals were available in the US through ESPN 360 and in Canada through BoxCast, so we'll assume the same for the final. These two met twice during the regular season. Cornell took a 2-1 win in January, but Clarkson beat them 5-4 in overtime in the last game of the regular season. Cornell has played themselves into a pretty great position, but there are still scenarios in which they would not receive one of the at-large bids. As a result, if they want to control their destiny, they're in a must-win situation. Clarkson, on the other hand, would not only be in, but would host a quarterfinal game, no matter what happens in this game. The Golden Knights handled Princeton with absolutely no problem on Saturday. Cornell showed an equal ease in dispatching St. Lawrence. Both teams should be well-rested and ready for puck drop. The Big Red have split time in net this season between two goalies, though they've stuck with Paula Voorhies over the past few weeks. Clarkson has Patty Kazmaier top-three finalist Cayley Mercer, and Cornell will need to find a way to contain both her and Genevieve Bannon. Cornell has been less prolific on offense over the course of the year, but they are as stingy on defense as the Golden Knights are. Northeastern upended BU to advance, while BC needed two overtime periods to dispatch Vermont. Watch: This game is being broadcast on NESN. These two have played four times this season. Back in November, BC won 4-2 and the teams tied 2-2. They split a pair of games in February, with each team winning 2-1. BC's win was for the Beanpot title. The Eagles have the best power play in the country, and each team has a solid goaltender. This game will likely come down to a single breakdown by one of the teams. Boston College advances to the NCAA tournament with all but one scenario, but if they win they will host a quarterfinal game. The only way for Northeastern to earn a berth is to win this game. Wisconsin advanced with a 2-1 win over North Dakota. UMD needed two overtime periods to beat Minnesota -- the game lasted three hours and 20 minutes. Watch: The game will air on Fox Sports North and Fox Sports Wisconsin. This game is probably the marquee match-up on Sunday, not just because it's no. 1 vs no. 2, but because both times they met this season, the teams have been missing key players. When Wisconsin traveled to Duluth, they were without their Patty Kazmaier top-three finalist Ann-Renée Desbiens, who missed the games with an injury. When Duluth traveled to Madison, the Bulldogs were without their Patty Kazmaier top-three finalist Lara Stalder, who was playing in Olympic qualifiers with Team Switzerland. 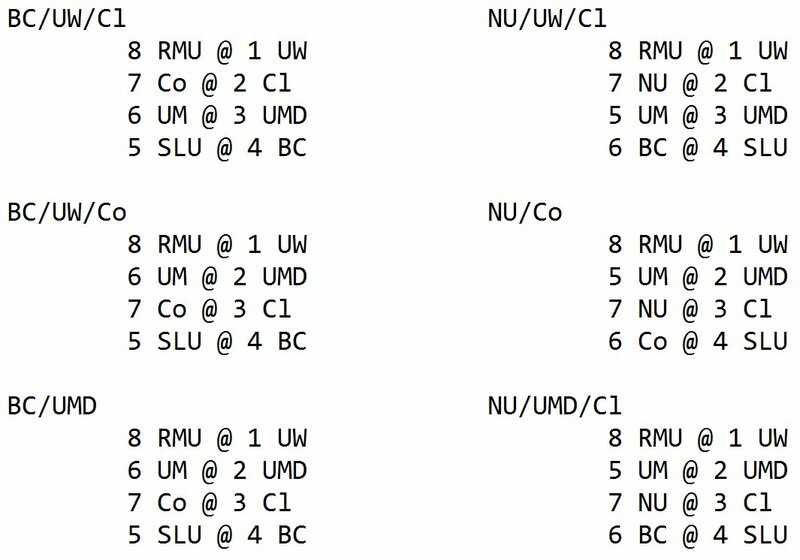 UMD was missing four players that weekend due to qualifiers or injury. So the championship game features the two top teams at their best...or as close to it as UMD can be, with about 15 hours between them leaving the ice on Saturday and puck drop on Sunday. I said in the semi-final preview that big-name players are the ones who step up in big-name games. Stalder scored the game-winner on Saturday while she was actually playing on the blue line for the Bulldogs. She whacked at a puck just below the cross-bar height to score. For Wisconsin, Emily Clark scored the game-winner with less than three minutes to go in the game. It was her ninth game-winning goal this season and the 20th of her career. She has a knack for being in the right place when her team needs her to be -- as well as for exploiting the smallest of opponent mistakes. Now, on to scenarios. There are six combinations of wins and losses that beget our likely tournament field. Based on Grant's predictor, there is no scenario in which Wisconsin does not earn the overall number one seed and host the eighth seed, CHA-winner Robert Morris. For all intents and purposes, those two are set. Clarkson and Minnesota-Duluth will end up with the two and three seeds, but who ends up where depends on a few things. Clarkson gets the nod if they and Wisconsin both win. The BU/NU game does not have any bearing on them. UMD earns the two spot if they win, but they also earn it with a loss and a Cornell win. The one scenario in which Boston College does not receive a bid is if they lose and Cornell wins. The two unranked teams taking auto-bids pushes BC out. Barring that happening, Boston College will either be a four seed or a six seed. They'll end up fourth and host a quarterfinal if Wisconsin wins. They'll also end up fourth if they win and the Bulldogs win. BC ends up sixth with a loss and a Clarkson win. The UW/UMD game has no bearing in that scenario. Grant did not find a scenario in which Minnesota does not earn a bid. In every scenario, they end up in the bottom half, and travel requirements will send them to Duluth. Minnesota gets the fifth seed in any scenario in which Northeastern wins. They'll get the sixth seed if BC wins. Cornell is the team with the most scenarios. If Northeastern and Clarkson both win, Cornell does not make the tournament. If Northeastern and Cornell each win, Cornell gets the sixth seed. Cornell gets the seventh seed in every scenario in which BC wins. The only way Northeastern qualifies is to win. They'll end up with the seventh seed if they do. Make sense? There's a handy chart, but I'm not sure it's all that much clearer. But regardless of the outcome, there's women's college hockey to enjoy. Even if you're not home, tune in your TV. Set your DVRs. Let's prove that people are interested in the sport and that it needs to be broadcast more often. The official NCAA selection will take place after these games wrap up tonight at 9:00PM.